make the 2019 event a success. 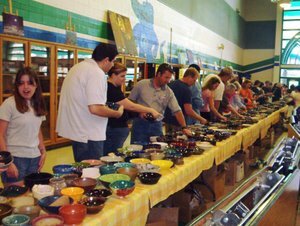 Each spring since 2000, Nevada Clay Guild members and friends have donated hand-made ceramic bowls for the Las Vegas Catholic Worker Empty Bowl Benefit. People are invited to choose their own unique bowl and enjoy a luncheon of soup and bread. Many people buy multiple bowls for gifts. It is a great family event with fun for kids. Live and Silent Auctions of original ceramic and painted art are featured. Thanks to the Nevada Clay Guild, Green Valley High School, Mission Hills Pottery, Aardvark Clay, and all artists who have participated in making the bowls and auction art. This event is sponsored by the Nevada Clay Guild, Green Valley High School, Mission Hills Pottery, and Aardvark Clay. Sign-up for our Mailing List to be reminded of future Empty Bowl Benefits.